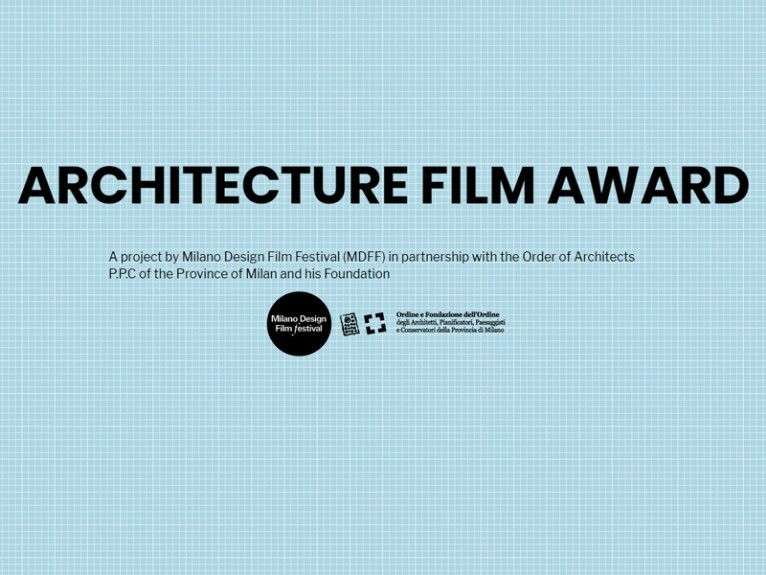 In collaboration with Fondazione dell’Ordine degli Architetti P.P.C della provincia di Milano (FOAM), the Milano Design Film Festival (MDFF) promotes and supports the biennial International Architecture Film Award for films on the subjects of architecture and landscape. The films may be fiction, documentaries, feature films, or short films. The purpose of the Award is to encourage the production of cinematographic works on these subjects, and to encourage and motivate architects in the use of audiovisual language as a means of communication. The Award is organized in two openly presented phases. The works that are competing for the prize are put through an initial pre-selection phase. These works will be published in the programme for the Milano Design Film Festival in October 2019 (the dates will be announced within January 2019), and will take part as a separate section. The works that are chosen to enter the second phase will be evaluated by an international jury during the festival itself. The jury will award prizes for two categories. Participation is open to persons over 21 years of age of any nationality. Their works must have been carried out during the 2016-2019 three-year period (finalized between January 2016 and June 2019). The Award is open to film projects dedicated to architecture in its broadest terms, ranging from interior design to urban building and landscape planning. The films may focus on aspects of actual or imagined structures that relate purely to architecture, and to aspects that bring in other fields, such as art, music, theatre, literature and technology. Films may be nominated for participation by directors, clients, and producers. Works submitted by anyone other than their directors must be accompanied by a declaration of assent to participation given by their designers. In the case of collective works, a single nominee is to be referred to the secretariat. Registration for the Award and submission of the required materials must be made no later than by 28 June 2019. – The “Architecture’s film”, for films (medium-length and feature films) about ancient, modern and contemporary architecture, will be awarded a prize of € 7,000.00 (seven thousand). – The “Studio’s film”, for audio-visual projects commissioned by architecture firms to promote their projects, will be awarded a prize of € 3,000.00 (three thousand). The Festival will also have an Out of Competition section in which works that are considered of interest by the jury, but which are not eligible to compete for the prize, will be screened.